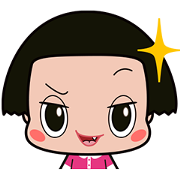 Here are stickers of cute and funny Chiko-chan from the new-style quiz show, "Chiko-chan ni Shikarareru!" This five-year-old girl is brimming with curiosity and unexpected questions about everyday life. Prepare to be wowed with lots of fun, surprises, and random trivia for the whole family!